Not sure where the “hucho’ came from, but I know it has nothing to do with running “hooch”. The Mongolian Taimen is native to a large area of Russian River basins including the Volga and Pechora rivers, then east to the Yana (north) and Amur (south) rivers. Very prevalent in Mongolia, this big game fish can be found in the Pacific and Arctic drainages of the Amur river in upper Russia and Mongolia. This prehistoric Trout requires moving water and tends to keep to the mouths of tributaries. Sometimes found in lakes, they typically are not migratory like other members of the Salmon family. They are known however, to undergo migrations to spawn. They are at bit like me, they don’t want to move, but if they have to they will. 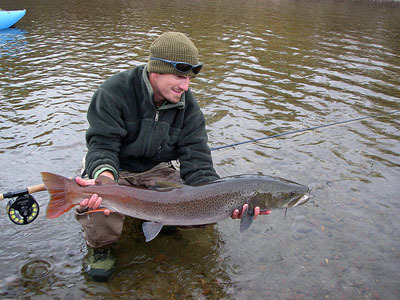 Usually, Taimen are a dark green blending to brown, going from head to tail. Basic trout colors, as you can see, except for the Russian red fins that are characteristic of the species. These fish are the largest member of the Salmonid Trout family and can grow to HUGE sizes, guys. An actual average size is not known, but one caught in 1988 was 231 pounds and almost 7 feet in length. Now that would almost be a personal best for me. Just kidding there. The verified IGFA world record is a shade under 100 pounds, though. Cannibalistic is the word best used to describe the diet of the Mongolian Taimen. The actual term is piscivorous, for all you smart guys/girls out there. All it really means is that they mainly eat other fish. But here’s a surprise for y’all. They are known to hunt waterfowl (ducks, geese, etc.) as well as terrestrial rodents that wander into the water. Taimen eat like all other salmon-like swimmers; opportunistically. When food becomes available, they become hungry, like the average human teen-ager. As these are basically a big trout, we can eat them like trout. Baking, broiling, grilling, smoking and pan frying all work well for Taimen. The fish is so large, though, that steaks are usually more readily available. Other than their prehistoric, humongous, larger than life size, these fish look like an oversized brown trout. The color changes from dark olive at the head to a brown at the tail end. The belly can be anywhere from a whitish hue to dark grey, and there are ALWAYS fins that are red. I would tell you which ones, but if you are lucky enough to hook into one of these babies, you’ll know. Now I have never seen one of these in the wild (can’t really afford a vacation to Mongolia, ya know), so I am relying on photos here. Really, these Aquarians resemble larger carp I have caught here in the USA. The colors are almost identical and carp DO get to that size. However, the average size of a carp is about 20 to 30 pounds. 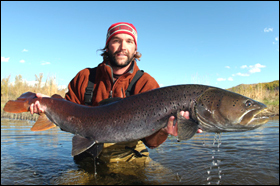 Taimen average nearly 3 times that size. For further information, please CONTACT US or visit our ONLINE FLY SHOP.